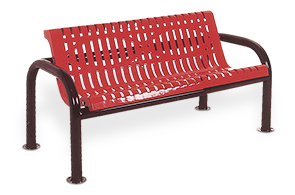 Durable yet stylish and will get noticed, the wave pattern steel bench also provides convenient reliable seating. The modular design is expansive, individual stand-alone benches can be connected with add-on units to increase seating capacity. These modern engineered benches have a 2-3/8"O.D. steel tube frame and one piece contoured seat and back constructed with 12-gauge sheet steel. Diligently MIG welded and crafted, these benches feature smooth rounded edges increasing the comfort and safety. 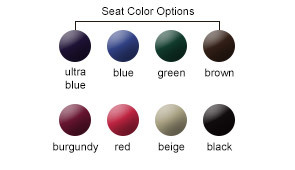 Sealed in impact resistant, UV stabilized ultra-modern finish coatings, the frame gets a resilient powder-coating and seat assembly is finished with durable polyethylene to help maintain pristine aesthetics. Enhance parks, gardens, schools and other outdoor facilities, applications are countless with portable, surface and in-ground mounted wave steel benches.